Teachers and students must be registered to enter the interactive forums on the iEARN Collaboration Centre. To register, visit collaborate.iearn.org and click Sign in/Sign up in the top right corner. From here, you will see an option to "connect" with iEARN. 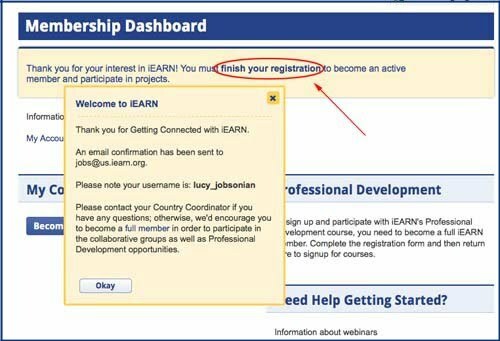 Educators or Adults interested in getting more information about iEARN can fill out just the first part of the registration to "get connected." This first "Get Connected" page is a short form that asks basic info like Name, Email, and Institution. The "institution wizard" on this page will try to associate you with the right institution if it has already been registered by someone else. 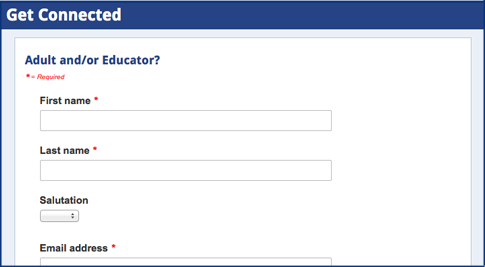 You can also post comments or questions about iEARN as part of this "Get Connected" stage. Once you submit this, it will be sent to the iEARN country coordination team in your country. If there's no iEARN country coordinator in your country, don't worry! Someone in another iEARN country will follow up with you. If you are just interested in learning more about iEARN, you are done at this stage. For those who want to register a full application to become an iEARN member (i.e. for educators who would like to get their students involved in iEARN projects), be sure to complete the full registration process. You can find the link to "finish your registration" on the Member Dashboard page which comes next. The above link will take you to the final stage of the full registration page, pictured below. After you have submitted an application to join iEARN as a member, your registration will be sent to your iEARN country coordination team to be reviewed. Please note that this can take a day or more. In some countries, iEARN centers may contact you to request additional information, and in some iEARN countries, there may be a small fee to join. 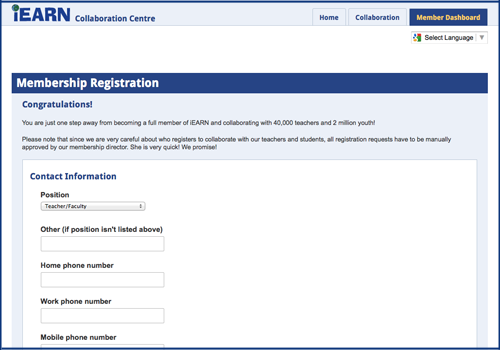 If your registration is approved and your account is activated, you will receive a message will information about logging in to the iEARN Collaboration Centre. That's all! Want info on registering students? Go to the next section.